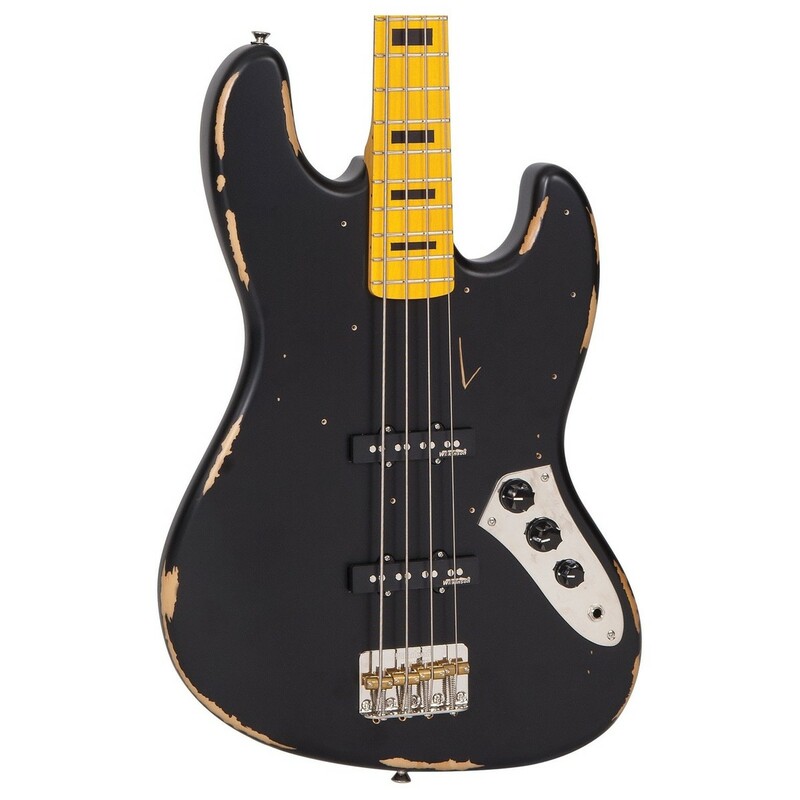 The Vintage VJ74 Icon Bass MN, Distressed Black delivers the worn in look of a bass that’s seen decades of playing, but with fresh electronics to deliver a truly old-but-new performance. Underneath its road-worn finish lies a lightweight Eastern poplar body, providing a beautifully broad dynamic range suitable for a wide variety of playing styles. Coupled with the body is a smooth maple neck and fingerboard, adding extra layers of brightness to create sparkling highs, thick lows, and a punchy midrange. A set of Wilkinson bar pickups are also added, delivering a wide range of stunning soundscapes with crisp, clean note definition. 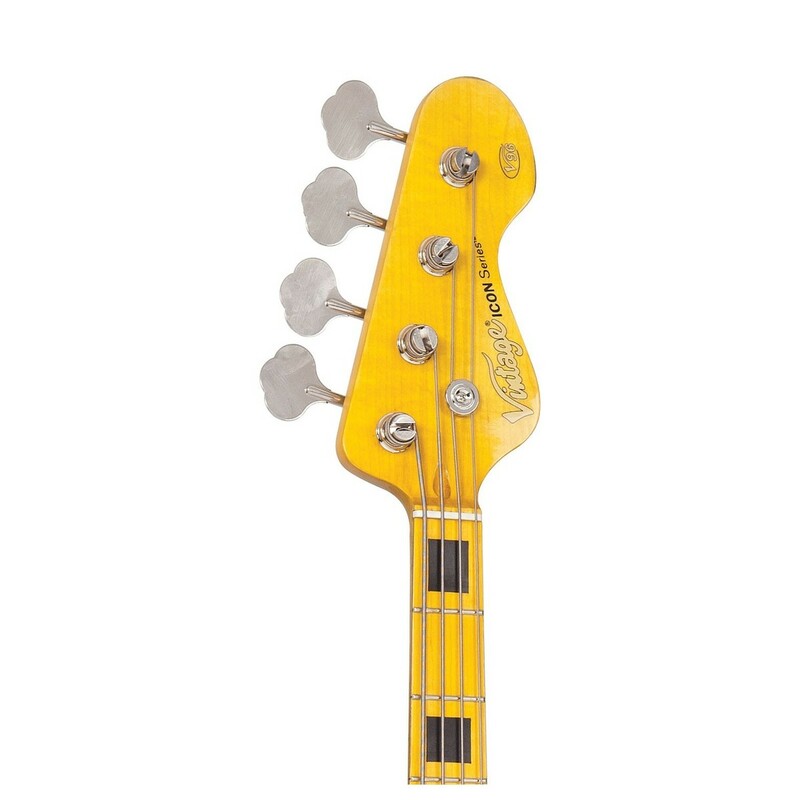 Finished off with an adjustable bridge, graphite nut, and Wilkinson machine heads to provide excellent string and tuning stability, the Vintage VJ74 Icon Bass is the perfect companion for bassists wanting high-quality performance with a battle worn aesthetic. Equipped on the Vintage VJ74 is a set of Wilkinson’s bar pickups, delivering crisp, clean tones with a wide sonic palate to suit a variety of playing styles. These pickups deliver a performance and tonal capabilities worthy of a high-end bass, with clean note definition and an excellent dynamic range ideal for anything you throw at it. Also quipped with independent volume controls and master tone, the Vintage Icon bass deliver a wide range of stunning soundscapes suitable for any setting. Along with its stunning vintage tones, the VJ74 is crafted with a classic design, offering players stunning tonal capabilities and an incredibly comfortable performance. Its body is constructed from lightweight Eastern poplar, delivering a beautifully broad dynamic range ideal for a wide variety of playing styles. 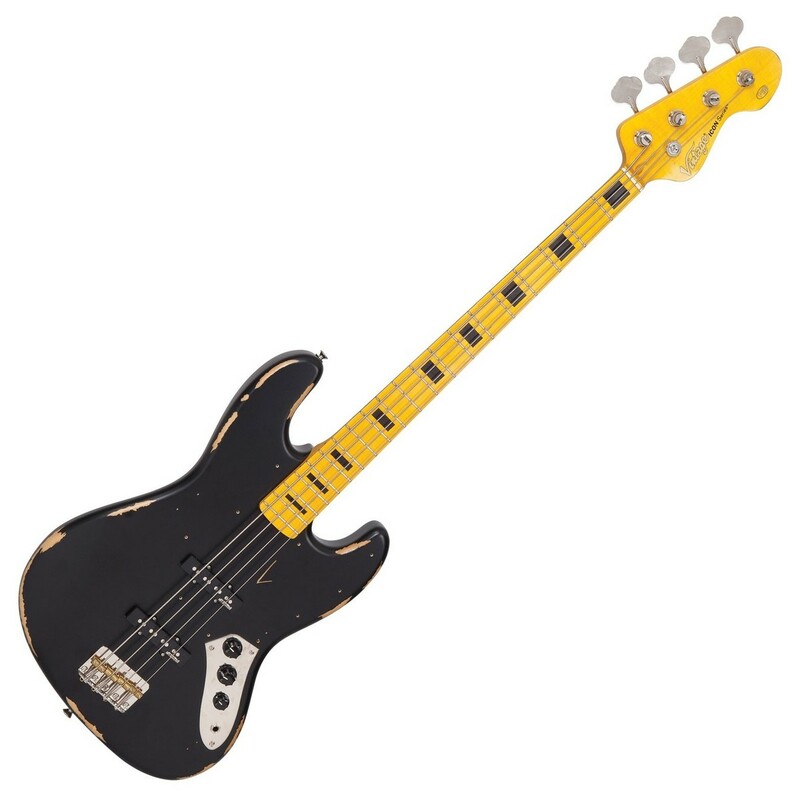 Combined with a hard maple neck and fingerboard, the Vintage VJ74 Bass produces sweet tones with plenty of brightness and volume to create punchy mids, thick lows, and a sparkling high-end. The combination of the body’s light weight and the smooth feel of the maple ensure players receive an incredibly comfortable playing experience. To create that iconic look of an instrument that's seen decades of playing, the Vintage VJ74 is coated with a distressed black finish and worn lacquer to give it that worn in appearance. The heart of a good bass sound lies with the string anchoring, and the addition of an adjustable bridge, graphite nut, and Wilkinson machine heads make sure that's the way it stays. The VJ74's bridge features a face mounted and fully adjustable design, with the rear loaded strings passing over the chunky bridge saddles for maximum bottom end tone. The Wilkinson WJBL200 machine heads provide an incredibly smooth action for quick and easy tunings, while the elephant ear style tuning keys add to the VJ74 Icon’s classic appearance.